A voice is a powerful thing. And I mean a voice, literally. Attitude reflects in your voice. Confidence portrays in your voice. Vulnerability exposes itself if you speak without vindication. And depending on my mood, I can show any and all of these things in my voice when I talk. You can see it in the reactions and expressions of other people. It was one of the most embarrassing moments of my life. September 2013, my first full team meeting under my new role as the manager and I stood up to begin what I thought was going to be an amazing speech. Well as it turns out, it was a far cry from that. I never realized what it took to lead and direct an entire meeting. It's very different from giving a speech or presentation like we all did back in school. Those have an identified direction, beginning, and ending. And everyone knows it. When you lead a meeting it's an entirely different feeling. The whole direction, tone, feeling, dynamic, etc, etc, everything is depending on you. And my first one was terrible. I didn't realize the burden that was going to instantly drop on my shoulders as soon as I stood up and began to speak..
My voice was quivering so bad I almost didn’t keep it together. All I can remember is thinking to myself, "wow you sound so insecure and nervous that there is no way these people are going to take you seriously, much less work for you." Oh, and just thinking that to myself made it so much worse. The longer I went, the worse I got. I ended early and remained sitting in the conference room while everyone left. I was in disbelief at what had just happened. I didn't even believe in myself, how in the world could they?! 1. Volume: Think about it like this, if a conference room full of people can't hear every word that you say, you probably aren't talking loud enough. Volume expresses confidence, which expresses authority, which makes your audience more likely to trust and believe in what you are saying. You can even say something that is completely false but if your audience doesn’t know any better, and you speak with a volume of confidence, they are likely to believe you. Isn't that all that you care about anyway, if they listen to you? I’ve known many people throughout my life who are quiet talkers and it’s extremely frustrating! My rule of thumb is this: After 2 ‘what’ questions and I still don’t hear you on the 3rd try, I automatically shake my head yes and agree with whatever you are saying.’ Who knows what you are saying and who cares?! If you can’t speak up loud enough for me to hear it then it must not be that important. SPEAK UP! The one issue that Randall never had trouble with other people was them asking him ‘what’. Occasionally he would even win arguments and debates in situations that he had no business winning at all. All because his volume of speech was high, clear, and displayed confidence in what he was saying. Volume matters. 2. 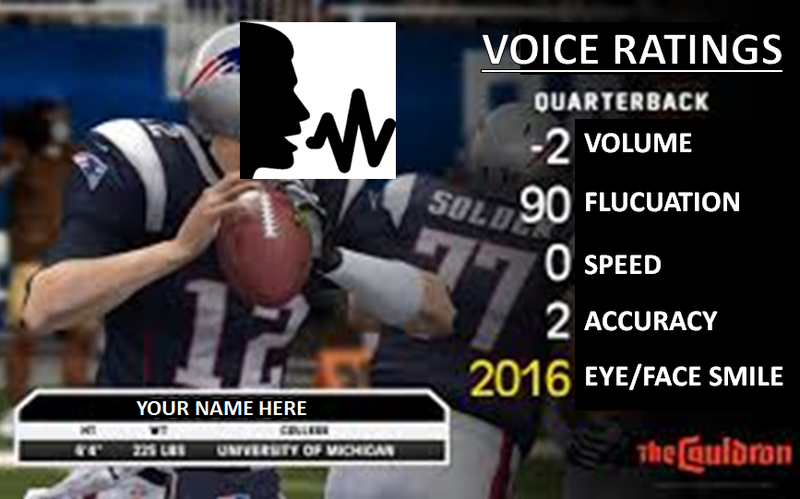 Fluctuation: Voice fluctuation can be very convincing. If you can master fluctuating your tone as you speak, you can seemingly transfer your emotions onto others. Have you ever felt someone else's pain? You can feel their excitement and energy also. Think about any motivational speaker, they are constantly fluctuating their voice up and down, and up and down. I would say this is probably most evident in music. Singers have mastered the ability to fluctuate their voices to fit the sound of the music. You can be saying the most dynamic thing in the world but if you are completely monotone in your voice, you will lose your audience and never convince anyone of anything. Show some energy and show it in your voice. Raise your pitch when you are excited about something! Even if you aren’t actually excited about it, you may be able to convince the other person just by talking passionately! Monotone is boring, and you will lose my attention very quickly. I need some voice fluctuations to keep me engaged, almost like I’m listening to a song or watching a movie. If your pitch is always the same than it seems like your story doesn’t have a beginning, climax, or ending. Or, if you are fluctuating your voice constantly throughout the conversation, listening is like a roller coaster ride or a great movie or song. By the time you finish, I need to be totally convinced that you believe in what you are saying, so I can also. Go listen to any Eminem or Lil Wayne song; I would say they have figured this out. 3. Speed: The faster that you say something, the smarter you sound. We all remember that stoner in college that you could instantly recognize. As soon as he began speaking it was so slow, tedious, and just drug out. (Get it?) "Heyyyyyyyyyyyy brooooooooooooooooo..." they would say and it always grinded on me. I felt like yelling at them to talk faster. They are all great people though? They just talk really slow and it drives me nuts. I’m completely lost half way through the first sentence because my brain is running laps around them. I'm not sure if they can't think any faster or if they are just always high? Ok, so either way, you need to talk at a decent rate. Slow just sounds unintelligent. 4. Accuracy: I would also like to mention vocabulary but that dives into an area deeper than your 'literal' voice, so that's a different topic. But the accuracy of what you are saying is critical. Don’t be one of those people who just talk to hear themselves speak. Talk talk talk talk talk talk talk, but they never actually say anything. Speak with a purpose. Sometimes saying less is more. I’ve been in situations where I talked myself into a trap just because I felt a pressure to keep talking. I wouldn’t even know what I was trying to say! So be purposeful when you speak and say it descriptively. Your goal should be that you NEVER have to repeat yourself. If you understand what you are talking about and how you want to say it, rarely will someone ever ask you to repeat yourself or a follow up question for better description. Start paying attention to how often people ask you to repeat yourself and how often they ask follow up questions for better explanations, you may soon realize that your speech can be more accurate. 5. Smile With Your Eyes: The final point that I want to make is one that everyone knows, talking with your hands. We all know Marty Smith on College Game Day and his famous fist clinch. But since everyone has already heard of that, I want to talk more specifically about your eyes. Yes, I have recently adopted the hand gestures of Marty Smith, but even before that I stole the facial expressions (specifically eyes) from my brother’s fiancée. I've never known someone who speaks more with their eyes than she does. Her eyes literally smile simultaneously with her mouth, and the result is always an engaged audience. She sells me with her facial expressions. So I have actually practiced smiling my eyes, simultaneously with my mouth. It's not the easiest thing to train yourself to do but if you can, it’s very convincing. Now combine your dynamic hand gestures with a smile that works simultaneously with your face and all of a sudden; you are very compelling. Your sound is something unique, powerful and just like anything else; you can improve your sound by practicing. My practice arena happens to be in my car. Many, many times I have been caught in the act of an intense practice session, usually singing along to a rap song in my car and yes, it is very embarrassing. But the risk of looking like an idiot for a second is worth the development of my voice. So the next time you see me driving by, I’ll probably be singing at the top of my lungs, just hoping that no one that I know recognizes me. Who cares though.. Don’t take your sound for granted. Practice your voice and be a voice!